J O' Callaghan with Bono sporting cool shades and a cool ShowbizIreland.com business card! Both Bono and Andrea Corr are sharing their birthday's this week with 007 star Pierce Brosnan. Bono was 40 last Wednesday, Andrea was 26 this Wednesday while Pierce is 47 today. Last week both Bono and Andrea were out to celebrate their special day by joining friends at the opening night of art exhibition by Guggi, Bono's best friend. 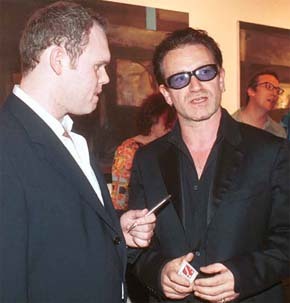 "I'm in denial" Bono told ShowbizIreland.com about turning 40. "I don't consider myself old yet. I see myself old at 60 but a cool 60 like those blues guys." Sporting a new mustache Gavin Friday another of Bono's best friends confirmed rumors that Bono and his closest friends flew the star for a four day party around the world two weeks before hand which started in Cannes, Italy and Spain. Then both friends presented Bono with a portrait of himself painted by Guggi and Gavin titled "Portrait of an artist as a man." As for Andrea Corr. Other guests at the exhibition in the Powerscourt Centre included U2's manager, The Edge, Adam Clayton, and Caroline Corr. Finally, Bono must be getting budget wise in his old age for it was only last Saturday that he was spotted on a shopping spree with his baby boy Eljah Bob during BT's 20% discount day.